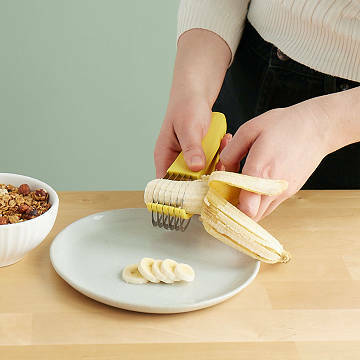 With this simple, one-handed gadget, cut six perfect banana slices at a time for cereal or fruit salads. Dear Knives: Busy moms, students, and time-pressed commuters demand perfect banana slices, and you're not cutting it any more. See, this simple, one-handed gadget chops a half dozen of them at once. We just put the peeled fruit in, squeeze, and the uniform slices drop right into the cereal or salad bowl, or onto peanut-buttered bread. Also, Knife, it's safer than you, with no sharp, exposed blades. Did you notice it's yellow and banana-shaped? No offense, but you're not. Finally, we would like to conclude with these words of wisdom: Slicer, slicer, bo-bicer, Banana-fana fo-ficer, Fee-fi-mo-micer, Slicer! Made in China. My mom eats Cheerios with milk, sugar, and bananas every single day. I found this and thought it was perfect. She uses this product every day. Her only complaint is that it doesn't separate the banana slices.